I made a clock today and I'm so happy it actually works! It runs upwards of 20 minutes before you have to rewind it, and is currently running at about 58 seconds per minute. Baby steps, ok, baby steps. As you can see, this is a very spread-out clock. The gear chain is laid out in a line: second-hand on the left, minute-hand in the middle, and hour-hand on the right, with each hand having its own dial face. I did that so you can see the gear chain that reduces the speed by factors of 60 and 12 respectively between the second, minute, and hour hands. Analog clocks with hands, even ones that run on a battery, are all about this gear chain. In a normal clock they fold it in on itself so that all three hands end up in the same place, on a single dial face. That's great for being a useful, compact clock, but terrible for seeing how the gears work. A crucial part of every purely mechanical clock is the escapement. This is the part of the clock that translates the swinging motion of the pendulum into rotation at a precisely measured rate, and at the same time imparts tiny bits of energy to the pendulum on each tick, in order to keep it swinging. There have been many designs of escapement over the 700-odd years since the first "verge" escapements were developed in the late 1200s. My clock uses a version of the "anchor" escapement, the second type to come into common use (in 1657). There are newer, better designs, but they are less tolerant of mechanical imprecision. Clocks, and escapements in particular, are dependent on very high precision machining, so much so that it's fair to say that the entire field of precision metal working advanced for several centuries mainly to make better clocks. While I love my laser cutter and consider it to be a very precise tool, by the standards of clock making it is horribly crude. Good clock parts have errors measured in thousandths or ten-thousandths of a millimeter, so my laser cutter's tenth of a millimeter precision is pretty bad. 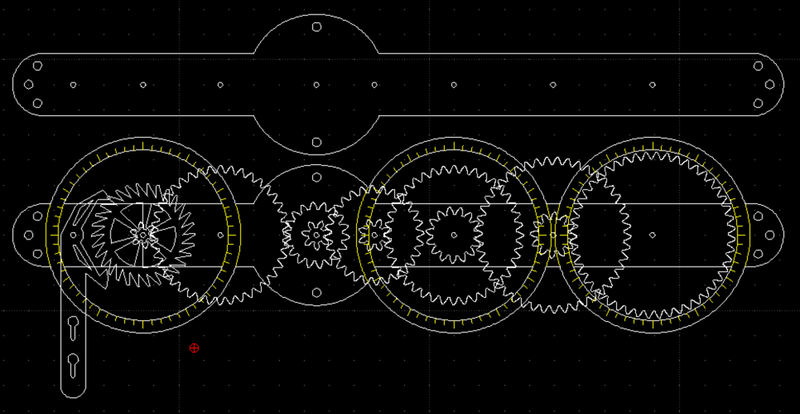 But, it's good enough to make this fully functional escapement, and that's what matters to me. (These, by the way, are the escapements that didn't work.) It took about a dozen tries before I got the dimensions just right so it would reliably advance, and also send enough energy to the pendulum. Another crucial thing about a good clock is how friction-free it is made. The less friction, the longer it can run before it needs to be rewound (either by re-coiling a main spring, or by lifting up weights whose slow dropping provides energy). To achieve low friction, all kinds of tricks are used, including extra-fancy oil and even "jewel" bearings made, typically, of sapphire. I have one "anniversary" clock that runs for an entire year without being rewound! By contrast, my laser cut acrylic clock runs for about 20 minutes before the weight (shown here) hits the floor. The weight is a hollow acrylic octagon, and if I make this available as a kit I will suggest that people fill it with whatever heavy things they have handy, like pennies for example. I filled it with #6 hex nuts, because I have a lot of them. 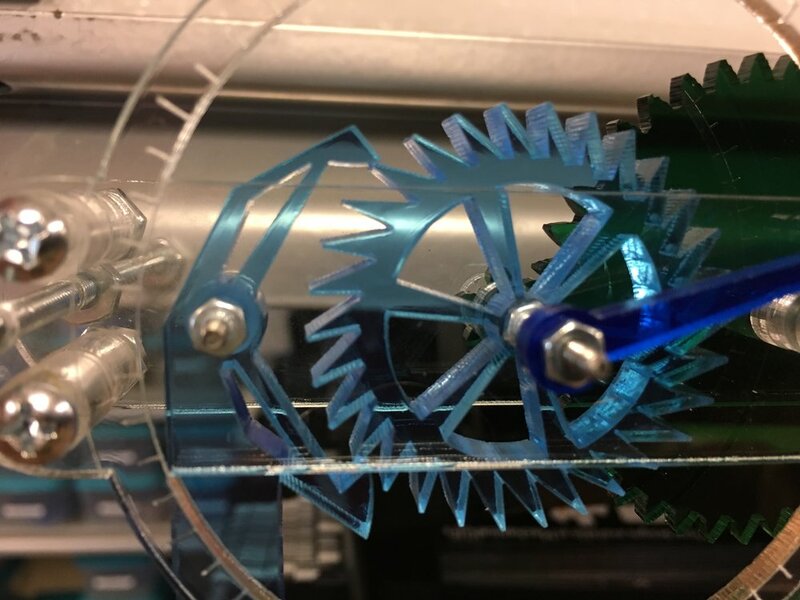 The weight falls fairly fast because it's connected at a point in the gear chain fairly close to the escapement, where the gears are turning relatively fast. If I connect it later on, where it would turn much more slowly and thus last much longer, there is too much friction and too much gear reduction, causing too little energy to reach the pendulum, causing the clock to stop. The pendulum bob, shown here, is the same design as the weight. Here's an interesting fact I learned in trying to decide how long the pendulum needed to be for it to tick at the correct rate. (The period of a pendulum is directly proportional to its length.) It turns out that a pendulum with a period of two seconds (which will tick once every second, since the escapement advances once every half-cycle of the pendulum) has a length very close to one meter. Why? Because that was the original idea for how a meter should be defined: one meter was proposed to be the length of a pendulum with a half-period of one second.